Included is the use of kayak & snorkel equipment. Kayak down the calm water mangrove canal and you may just catch a glimpse of the sea horses that are magically prancing just under your paddles! 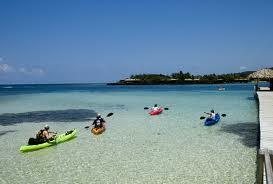 On calm days Kayak out to Mary’s Place to see the pristine coral reef and spectacular seawall! Available to you is a full service bar and restaurant (food and drink at additional cost), as well as free wi-fi and a rooftop terrace overlooking the East side of the island with full views to the south of the Central American Coastline. Be sure to bring sunscreen, insect repellant and your camera. Tour times are local time.